Here are the half hour breakdowns for the hour. 8pm 10.305 million viewers 2.8 in 18-49 and a 1.9 in adults 18-34 (CBS does very poorly in this demo, thats pretty good for them). 8:30pm 11.196 million viewers 3.2 in adults 18-49 and 2.2 in adults 18-34. Nice to see solid growth in the hour. Historical comparison only one other season aired on Sunday (during the spring), the same episode scored 10.74 million viewers (but a much healthier 3.7 in the demo). But still the viewer totals are really good. Better then anny episode of season 9, better then all but two episodes of All Stars (those are the last two seasons that aired in the Spring). yaya! did we win our time period? CBS placed first in viewers on Sunday led by the CBS MOVIE SPECIAL: JESSE STONE: THIN ICE and the best deliveries in all key measures for THE AMAZING RACE 14, according to Nielsen preliminary live plus same day ratings for March 1. From 9:00-11:00 PM, JESSE STONE: THIN ICE, the fifth movie in the Jesse Stone franchise starring Tom Selleck, was first in households (9.3/14), viewers (15.13m), while averaging 3.5/08 in adults 25-54 and 2.2/05 in adults 18-49. Compared to the last JESSE STONE movie (on Tuesday, May 22, 2007), CBS added +2.09m viewers (from 13.04m, +16%). At 8:00 PM, THE AMAZING RACE 14 was second in households (6.3/10) and viewers (10.75m) while averaging a 3.9/09 in adults 25-54 and 3.0/08 in adults 18-49. Compared to last week, THE AMAZING RACE was up +43% in households (from 4.4/07), +18% in adults 25-54 (from 3.3/07), +15% in adults 18-49 (from 2.6/06), +17% in adults 18-34 (from 1.8/05) and added +2.94m viewers (from 7.81m, +38%). This is THE AMAZING RACE 14's best delivery in all these measures. At 7:00 PM, 60 MINUTES was first in households (9.0/15), viewers (14.12m), second in adults 25-54 (3.4/08) and averaged a 2.2/06 in adults 18-49. Compared to last week, 60 MINUTES was up +55% in households (from 5.8/09), +48% in adults 25-54 (from 2.3/06), +38% in adults 18-49 (from 1.6/05) and added +4.94m viewers (from 9.18m, +55%). Yeah, I like the ratings, but a good chunk of that increase probably can be laid at the feet of the Jesse TV movie, which did fairly well viewer wise (though poorly in the demo). It would explain why the demo number for TAR was a little lower then I would expect with those viewer numbers. I would guess that more people who watch 60 minutes kept TAR on so they could then watch Jessie. Oh well, doesn't matter well take it. Doesn't matter if Tom was a factor, TAR did better than last week especially in this era where networks and cable are virtually on equal footing now. I'll take it as well, mswood. They publish two top twenty lists. One showing the largest increase in viewers, and one charts the largest percentage increase. We didn't make either list. Now that doesn't mean a whole lot. It means that we didn't gain at least 1.883 million viewers with DVR use over 7 days (which we almost never do), and we didn't see an increase of at least 20% over the live viewer levels (we typically are at 17-18%). CBS normally doesn't score high on increase by percentage (TAR Is on average CBS highest show in this category). And no CBS show makes the Percentage increase list this week. I would be worried if next week we aren't on the list. With a lower number of people watching live (we should see a spike in the percentage increase). Oh well. Because we don't have a ton of viewers and CBS in general has a low DVR ratio, we should probably expect to have several weeks with no data. But by CBS standards we have a very high ratio of DVR users. A >10 million ratings is GOOD. In this day and age, it's not American Idol ratings, but it's decent. Put Kelly Clarkson on the show. Please no. Kelly Clarkson is a major reason why the US is in bad shape. Final numbers are out for Sundays episode. TAR 10.597 million viewers and a 3.0 in the adult 18-49 demo. Only Two episodes during the last two spring cycles have been higher. So thats good. Also nice that we had the highest adult demo for CBS (which is typical, but very important). Very good news. Hopefully, the season can build on this. Canadian ratings for the week of Feb. 16 to 22. 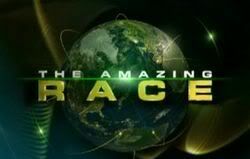 THE AMAZING RACE 14 was second in households (6.2/10) and viewers (10.60m). Compared to last week, THE AMAZING RACE 14 was up +41% in households (from 4.4/07), +18% in adults 25-54 (3.9/09 from 3.3/07), +15% in adults 18-49 (3.0/08 from 2.6/06), +17% in adults 18-34 (2.1/05 from 1.8/05) and added +2.79m viewers (from 7.81m, +36%). This is THE AMAZING RACE 14's best delivery in all these measures. We also ranked 18th out of all shows (thats nice). So great ! Best rating since Episode 1! We also ranked 24th out of the adult 18-49 (again CBS doesn't do that great in that demo normally, only 7 shows on CBS did better). All's good and if it continues to pick up, we might actually get more seasons coming our way! I wouldn't expect it to pick up, but if it can come closer to maintaining levels near 10 million we will be fine (probably good enough for two cycles). sweeps was in february. the next sweeps period is in may. Actually tory is correct this last Thursday was the official start of sweeps. Normally this is during the month of February, but due to the planned national switchover to HD signal they (whoever decides when the sweeps periods are) delayed it. They didn't want to see any confusion (or large segments of the population without coverage) to hit the period where ad rates are set. So they pushed it to start on March 5th. Of course, they didn't expect for the President to ask the FCC to delay the switchover. But since over a third of the nations stations did in fact already switch over (though typically not the largest markets), it worked out okay.